We have been looking for a way to design a collection that works for embroiderers who want to add designs to clothing and projects as well as quilters who want designs to fit perfectly on quilt blocks. We have found the solution and it is called Embroidered Additions. Embroidered Additions are our newest collections and they each consist of 15 different embroidery designs with each design coming in 4 different sizes. If you are an embroiderer you would use these designs just as you would any other embroidery design, but what makes these designs great is that they come in 4 different sizes so you wont need to use resizing software to find your perfect size. If you want to add these designs to a left chest of a shirt you can use the 3” or 4” version and if you want to embroider them on a sweatshirt simply use the larger version. 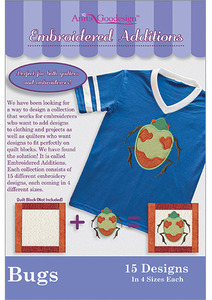 If you are a quilter you will now be able to create a beautiful uniform quilt without editing your designs. Each of the designs in Embroidered Additions is in a square size so there will be no rectangular or odd shaped designs that don’t look quite right. You would just stitch these designs on your fabric and create your quilt.